APi was established on the basis of the long years of research on semiconductors, optical communications and optical interconnection conducted by a group headed by Mr.Yoshiaki Nakano in his research lab. at the University of Tokyo Research Center for Advanced Science and Technology. APi has its sights firmly fixed on the activities in the global market and creates highly competitive products which may be regarded as global standard. APi infinitely pursues potential of photonics and creates new value, thereby contributing to development of society and mankind. APi manages its organization in a manner where incentives for its employees are harmonized with the company’s growth and profitability, and returns satisfactory profits to its shareholders. Sony’s F65 CineAlta Camera, which APi collaborated in the optical data transmission technology, was honored Academy’s Scientific and Engineering Awards. In the technical private show held by KT Group during 19th to 20th April, APi demonstrated a tiny high-resolution POF camera co-developed with KT Group and Honda Tsushin Kogyo Co., Ltd.
APi has released 100 Gbps Infiniband EDR QFSP+ AOC. On April 24th, 2014, APi was given coverage in the Nikkei Business Daily (The Nikkei Sangyo Shimbun, a cutting-edge industry newspaper issued by Japan most influencial publishing group). 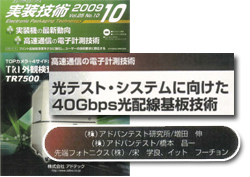 On Sept. 12th, 2013, APi was given first-page top coverage in Nikkan Kogyo Shimbun (a well established leading business & technology daily newspaper in Japanese language) for article titiled "100 Gigabit per second Optical Fiber Cable for Communication shows bright prospects for practical implementation". On Mar. 30th, 2013, APi was covered in the evening edition of Nihon Keizai Shimbun (a leading daily newspaper on economic and financial matters with large worldwide circulation, issued by Japan most influencial publishing group). APi will be exhibiting our new products and technologies at the “Large Electronics Show 2012” in Tokyo, in the Big Site convention facilities. This is to be held in June, over three days (13th to the 15th). Please come and visit us at our booth (50-1), situated near the entrance ‘East Hall 6’. Please come and visit our exhibition at the “ADVANTEST EXPO 2012”. This will be held in the Tokyo International Forum, on the 6th and 7th of June 2012. We will be exhibiting our new products and technologies at our booth, in the ‘Near Future/Future Zone’. Sony has recently announced a professional use movie camera, ‘CineAlta F65’, having the industries highest image resolution of 4K2K. This camera employs optical interconnect technology jointly developed with APi. APi will be taking part in “Photonix 2012”, which is to be held from the 11th to 13th of April 2012, at the Big Site Tokyo. We will be exhibiting our products and showcasing our new technologies at our booth (28-10) situated in the right side of East Hall 4. Please feel free to come and visit us. We gave an invited presentation on the MOT (Management of Technology) Special Educational Program, which was held at the Graduate School of Science and Technology in Kumamoto University, on the 23th of February. The talk was part of the venture study group business and was entitled, “How to target new markets created by technology～the challenges facing university based venture business companies”. The world's first mass production of a lensless optical interconnection module has been successfully undertaken, due to newly developed semiconductor technology. APi was showcased on the website of Tokyo Bureau of Industrial and Labor Affairs under the heading of "Bright technology: Optical Business."